Rab’s new and award-winning NeoStretch Gaiters have great breathability and lots of clever touches, but a few simple design issues stop them from being perfect. I’ve got mixed feelings about gaiters. They’re brilliant for keeping snow and water out of your boots, but they can make for lower legs that are hot and damp with the sweat the gaiters haven’t allowed to escape. This is a particular problem on those days in the mountains when it’s warm, but gaiters are still needed. Even if rain isn’t forecast and the sun shines warmly, gaiters can be essential because of the risk of putting your foot into a bog or slipping when crossing a stream. In Alpine conditions you can be toasted while on a sun-baked glacier and have to wear gaiters to cope with the snow on the peaks you’re going to climb. Rab hold out the promise that their NeoStretch Gaiters will make life more comfortable in such situations by combining one of the new breed of highly breathable fabrics and Rab’s usual, excellent design work. To see if this was true, I tried these gaiters out on walks in a snowy Lake District as well as warm weather and continuous, sometimes torrential, rain in Snowdonia. 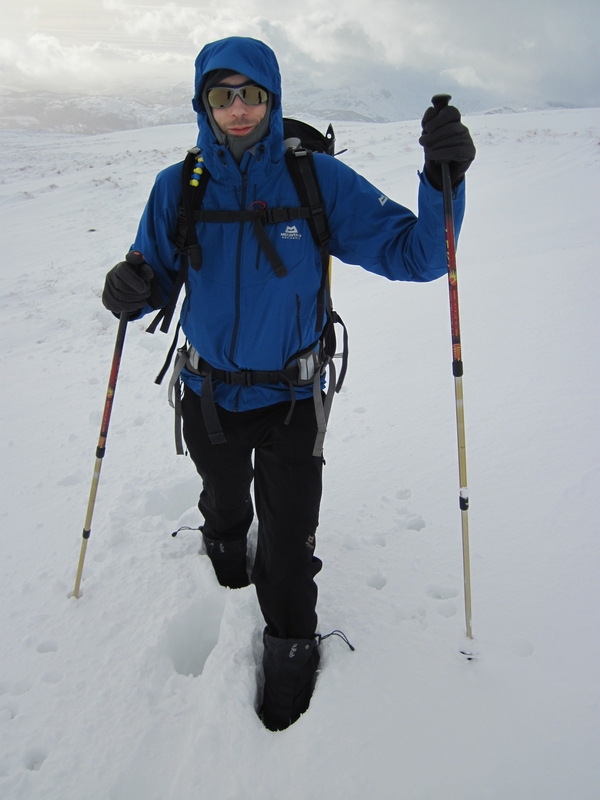 The NeoStretch Gaiters are essentially an adapted version of Rab’s popular Latok Alpine Gaiters. The main difference is the fabric, with the main body of the Neostretch using Polartec’s NeoShell fabric (more on this below) as opposed to the Latok Alpine Gaiter’s eVent. Both models use a more robust Cordura fabric around the lower part to cope with increased abrasion and rubberised under-boot straps that attach via Velcro on the insides of the gaiters. Both models also have the same, clever design for their lace hooks. Most gaiters have a lace hook that face down and hooks over bootlaces from above, but the Neostretch Gaiters have lace hooks that faces upwards. This means sliding the lace hook under the laces and hooking them from below. The Neostretch Gaiters and Latok Alpine Gaiters also both use a front opening held in place by Velcro. 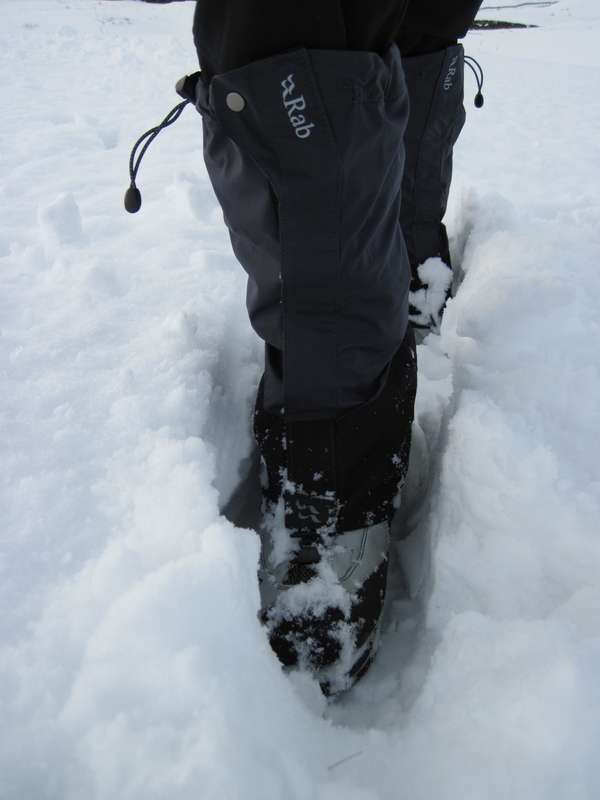 Some people don’t like Velcro openings on gaiters because they feel the Velcro doesn’t hold too well in snow. I’ve never had a problem and like how easy this design makes opening and closing the gaiter. This is something that’s particularly useful for adjusting shoelaces once the gaiters are on. Apart from the fabric, what sets the Neostretch Gaiters apart are silicon gripper strips on the top of the gaiter to prevent the gaiters sliding down your calves and on the inner heel to prevent the gaiters riding up the boot. The top of each gaiter also includes a drawcord to get them to hold in place and to make it harder for water to get in. Polartec felt this design was such a good use of their fabric, that they gave Rab an award. 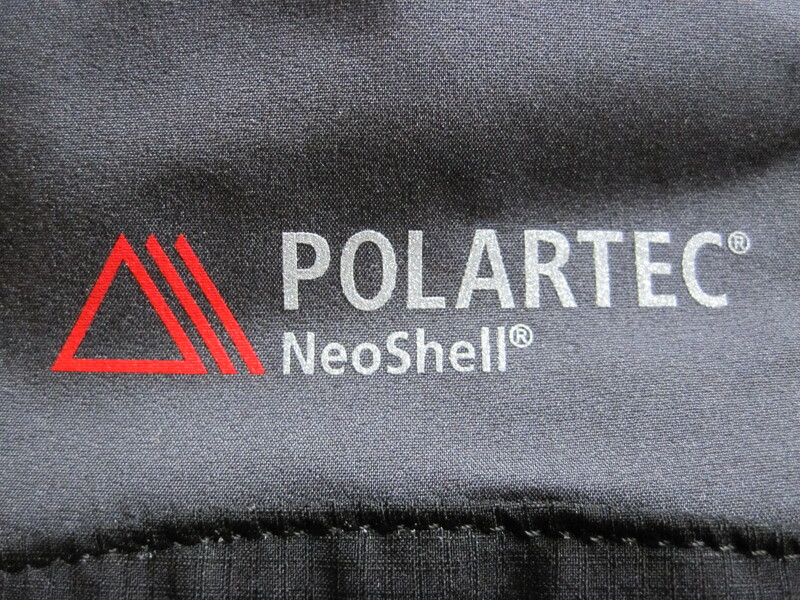 Polartec’s NeoShell is their entry into a clothing arms race that has taken place over the last couple of years and which has seen manufacturers bring out several new types of fabric (or membrane for fabric) that they claim are more breathable. This is great as you can get pretty wet if a waterproof garmet is not letting the sweat out as fast as you are producing it. Polartec claim that NeoShell achieves better levels of breathability than the competition by allowing more air transfer through the fabric. The downside of this is that the fabric is not 100% windproof and is not as waterproof as other fabrics. Polartec say that NeoShell is waterproof enough as the level of waterproofing to which competitors make fabrics exceeds what is necessary. There is a more detailed description of the fabric, and the science behind it, on the Rab website. The Neostretch Gaiters are very breathable and are easily the most breathable gaiters I have ever had. I didn’t notice any moisture build-up on the inside of the gaiters, even after a hard walk uphill. This level of breathability is certainly the main selling point of these gaiters. The NeoShell fabric is also softer than a hard shell, waterproof fabric and doesn’t make the rustling noise of those fabrics that some people can find annoying. There is some stretch in Neoshell, although I can’t see that as really being a bonus in a pair of gaiters unless you have the calf muscles of an Olympian. Having the Velcro attachment for the underboot strap inside the gaiters does make these gaiters neat, with no outside buckles or closures to catch on anything. The downside of this design is that you can’t adjust these straps while wearing the gaiters. More importantly, I found that the underboot straps don’t hold the gaiters snug enough against the sides of my three season boots to prevent some water and dirt getting underneath. The water and dirt don’t get too high up the boot and so wasn’t a real problem, but it’s not great that this happens. However, my three season boots are relatively narrow and the fit on my bigger, four season boots appears to be better. 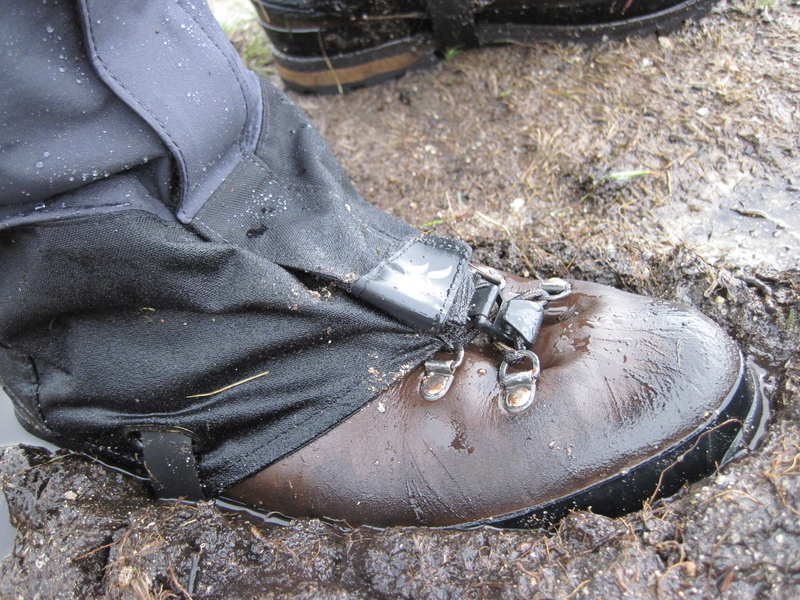 The Neostretch Gaiters hold my boots better around the front and the rear. This is probably because of the good lace hook and may be because of the silicon strips on the heel (it’s hard to tell whether it’s the silicon strips make a lot of difference or if it is the cut of the gaiter is just good). The silicon trim at the top of the gaiters is a nice touch to prevent them slipping down, but my legs are just too skinny for me to be able to tell if they really work and I still found that the gaiters slid down a bit. Usually the drawcords at the tops of the gaiters are at the rear or the front, but on the Neostretch Gaiters they’re on the side. This seems purpose-built to catch on things like bushes. Obviously, you can tuck these inside the top of the gaiter, but it’s an odd design. Rab’s Neostretch Gaiters have the breathability to make wearing gaiters more comfortable and they have some good design features. This means I’m happy with buying them and using them in the mountains. It’s just a shame that there are a few aspects of their design that are not as good as they could be. UPDATE: 4 April 2015; the newest version of the Neostretch Gaiters has the top drawcord on the back of the gaiter. How does the durability of the Neoshell upper compare with an all nylon upper? Ninety-nine percent of my time spent wearing gaiters is spent below treeline in fairly heavy bush. Do you think these gaiters would hold up? So far, I haven’t had any issues with the durability of the Neoshell. However, I haven’t put it though that sort of heavy use yet. I’m guessing that the Neoshell is probably about mid-range in terms of toughness. The fabric is fairly light, but thicker than an all nylon upper. I had a pair of OR Verglas gaiters until fairly recently and the Neoshell feels tougher than those. However, the Neoshell doesn’t feel as tough as a pair of OR Crocodiles (which I also have a pair of) and which are made of heavy duty Gore-Tex. It sounds like they should probably be able to handle things for me, then. I have an old pair of surplus Swiss Army waxed wool gaiters that I love to death, but I would like to have an alternative this season to minimize wear on my favorites. Hello, thank you for this good review, can you compare Crocodiles with Neostretch? what would you choose if you will have only one pair? Hello. Glad you like the review. I think it’s possible to make some useful comparisons with Crocodiles, but only as they feel like they are towards one end of the spectrum of light weight – heavy duty. A comparison also highlights some differences in the approach to the design that might affect which one you prefer or when you might use them. So, I prefer the lace hooks on the Neostretch and they fit much better around a three season boot than the Crocodiles. However, I like the webbing and buckle closure on the top of the Crocodiles and how tough they are. But the Neostretch and the Crocodiles do feel like they are meant for different things. So, I see my Crocodiles as something for serious winter conditions and prefer Neostretch for spring / summer / autumn when the Crocodiles might be overkill. If I were to go for one pair of gaiters from the two, then I’d go for the Neostretch because I can see myself being able to use them in a wider range of situations. The Crocodiles maybe more heavy duty, but my gaiters are under my waterproof trousers on a really rainy day and so the Neostretch would work better. 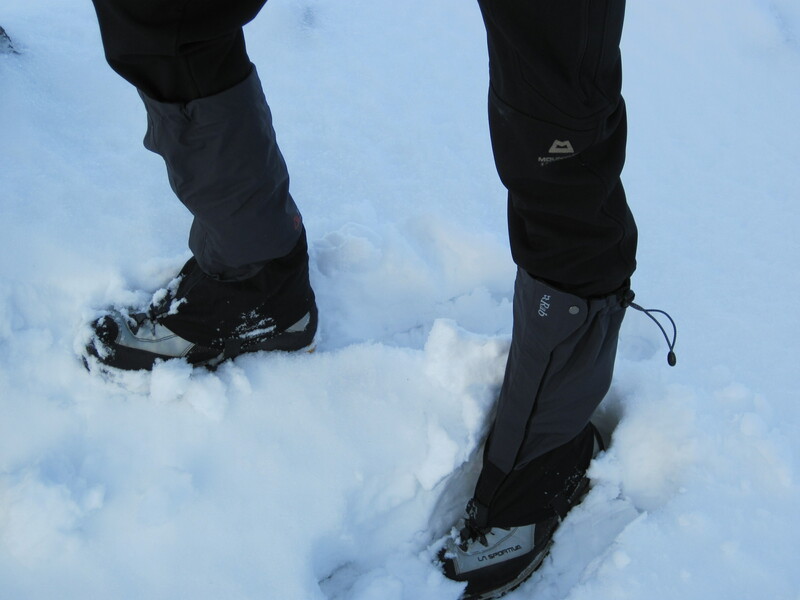 Plus, the Neostretch seem to be able to manage fine in winter conditions. So I will try the Neostretch and in case I will not feel the gaiters so short as you did (I am not tall, I think I will need the small size), I will go with these ones. If yes, then the Crocodiles. First use and already passed through with crampons. It’s really annoying when that happens. I’ve done the same thing with a pair of gaiters (not the Neostretch) when I first used them and I swore a bit. Is it a big hole?